Communication is the key to a successful interpersonal relationship, through words we can win hearts, through voicing out our opinions we can help the masses. Cellular networking devices have made our most and many problems sorted, even to the far distant friends and relatives we can get connected, radius does not matter to us anymore, since technology has made things way too simpler and way too easier. Just by touch/type we send the most important messages to far-off clients as well. Every born child is breathing in the environment where smartphones are immensely used. Big brands and big names who launch their smartphones keep an open eye to provide the latest features so people and consumers get attracted to them and don’t have second thoughts about buying them straight away. People these days are sharper, they are so shrewd enough not to spend extra pennies on a device that does not give a good deal, they look up to a cellphone of cheaper price having good features than buying a costly phone with the same features. Well it is all about perspective you see, some of us don’t really like to compromise on the quality and therefore leaning to a little brand for cheaper experience we refrain from it totally. 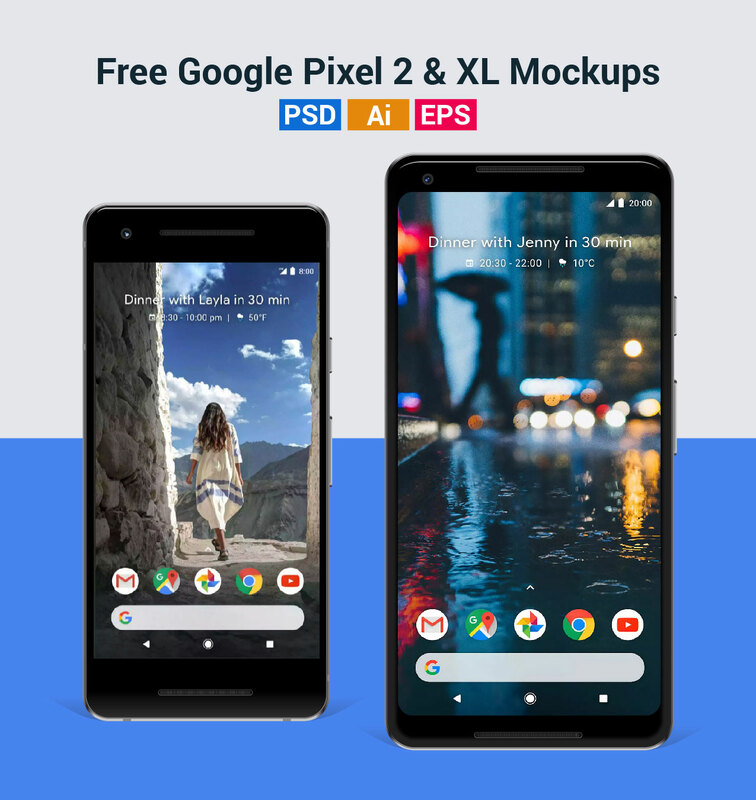 Latterly Google launched its two new smartphones that are classy and much advanced, here I am providing you free Google Pixel 2 & Pixel 2 XL mockup for the designers to make a presentation out of it if you have application design, gaming environment, or app layout or anything of this kind to display before your clients. Google Pixel 2 comes with slight changes but Pixel 2 XL is quite welcoming and innovative with its specs & appeal. Both these smartphones come with exceptional space so you better don’t be afraid of keeping 10000s of images and videos all saved at one place. For more freebies stay hooked because we have a lot of interesting stuff coming your way in the weeks ahead regarding art, design and technology. Subscribe us so not miss out on every design post. Here we go! Awesome mockup! You rock, Zee!